These five station-names have all been used over the years, in various combinations, to describe four different Tube stations in the area of the north bank near Waterloo Bridge… however the various names have applied to different stations or not at all at different times! Below is the definitive version of what was named what, and when. The lines and stations are referred to using their current names in ordinary type; names used prior to the final renaming of each station are emphasised for clarity. Many thanks to Geoff Marshall for his excellent tube-map illustrations created especially for this page. The District station at what is now Embankment was opened in 1870 as Charing Cross, since it served that mainline terminus. However, the Bakerloo Line station beneath it was opened in 1906 as Embankment. 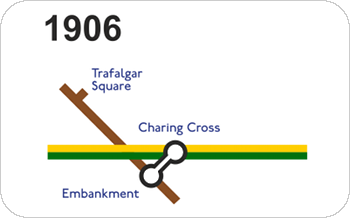 The next Bakerloo Line station northwards, at what is now Charing Cross, was opened as Trafalgar Square. When opened, the Charing Cross branch of what is now the Northern Line only came as far south as the forecourt of Charing Cross main-line station, and accordingly was named Charing Cross. Interchange with the existing District and Bakerloo stations was at street level. In 1914 the Northern was extended southwards to what is now Embankment to make this interchange more helpful. Naturally they wanted their new, better interchange to be called Charing Cross . So, to distinguish their two Charing Crosses, the original Northern Line one was renamed Charing Cross (Strand), and their new one plus the Bakerloo Line station at Embankment became Charing Cross (Embankment). 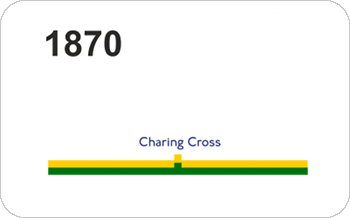 To further the confusion, in 1915 the tube stations of Charing Cross (Strand) and Charing Cross (Embankment) were changed to Strand and Charing Cross respectively. Unfortunately, the station illustrated here and latterly known as Aldwych had been opened as Strand, so it was re-named to Aldwych at this point. Strand station closed for rebuilding in 1973, in connection with for the Jubilee (then Fleet) line’s construction. When the Jubilee Line opened in 1979, Strand station re-opened under its final name, Charing Cross . It now comprised interchange between the Northern and Jubilee Lines, and the former Trafalgar Square station on the Bakerloo Line (hence the long subway). The names Strand and Trafalgar Square thus dropped out of use from this point onwards, except that the roundels on the Bakerloo platforms at Charing Cross bear the footnote For Trafalgar Square . Trafalgar Square became Charing Cross in 1979, with the platform roundels also bearing the legend for Trafalgar Square . For pictures showing the exterior of the disused Aldwych station, please see the General LU Photos page. There’s a final twist to this. 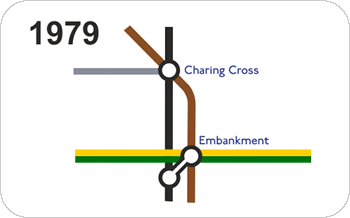 When through-running began on the Extended Jubilee Line on Saturday 20th November 1999, Charing Cross (Jubilee Line) station became disused. 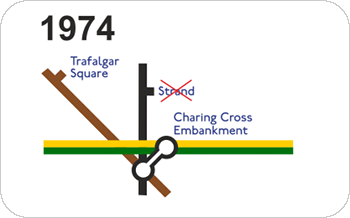 This means that the changes of the 1970s have effectively gone to waste: a person entering the system at Trafalgar Square’s entrances either catches the Bakerloo or walks all the way to the Northern station at Charing Cross forecourt, there being no operational Jubilee station between them.